Compose oven-baked and other kinds of culinary creations in a whole new key of delicious, with the Anolon Vesta stoneware 3-quart oval au gratin. The durability and functionality of Vesta stoneware begins with superior stoneware construction and continues with each piece's sleek, shapely design and a solid color glaze inspired by fine foods and flavors. Elegantly-Tapered walls with tulip-flared rims and curved handles with plenty of room for potholder grip provide the finishing touches for superb presentational flourish. Oven safe to 500 Degree F, this bakeware has versatility and convenience to spare. Fill this generously-sized baking dish with slices of local squash and root vegetables, fresh herbs and seasonings, and present the succulent side dish in a beautiful piece of bakeware to enhance all that creative flavor-building. The au gratin dish is microwave, freezer, and dishwasher safe, so use it for baking and roasting, and even as an occasional serving piece with confidence. With a quality assurance guarantee, Anolon Vesta stoneware makes a stylish and resourceful addition to the other Anolon kitchenware products designed for creative cooks everywhere. 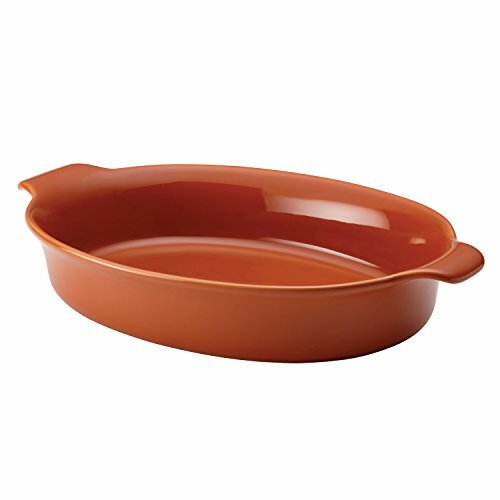 reach For the Anolon Vesta stoneware 3-quart oval au gratin when baking sides, entrees, desserts or when simply serving, for a dish as durable and distinctive as fine flavors are delicious.